The Ponce Carnival is Puerto Rico's Caribbean nod to Mardi Gras and its more famous cousin in Rio de Janeiro, Carnaval. A festival that has been held for over 200 years, it's the epitome of all things boricua and an annual testament to Puerto Ricans' capacity for whimsy and revelry. The carnival dominates the historic downtown area in the city of Ponce, with the bulk of events taking place at the Plaza las Delicias (Town Plaza) and the Casa Alcalde (Ponce City Hall). The celebration usually takes place in February, but always occurs in the days leading up to Ash Wednesday and the start of Lent. However, the Ponce Carnival will take place from Friday, March 1 to Fat Tuesday, March 5 in 2019. Parades will take place daily—starting with the Parade of the Carnival King on Friday night at 7 p.m. and ending with the burial at midnight on Fat Tuesday—and there will be plenty of dancing, singing, and live music performances to enjoy all weekend long. The vejigantes are the undisputed stars of the Ponce Carnival. 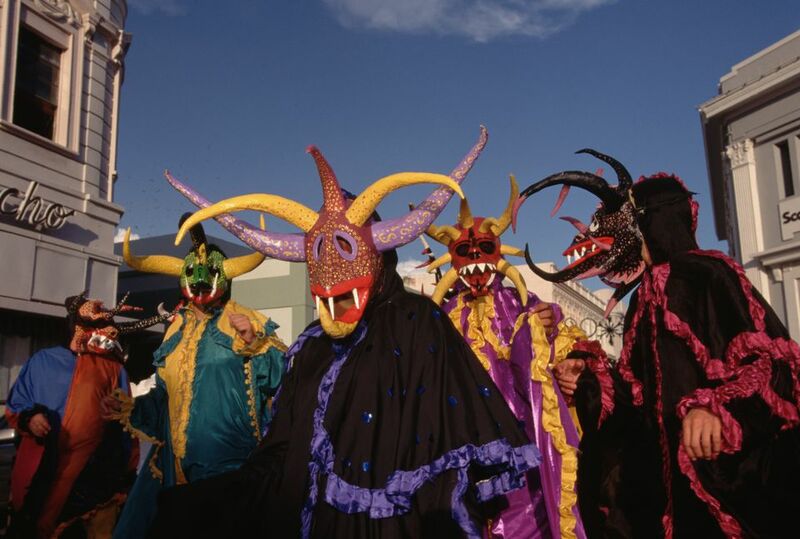 These demons are straight out of centuries-old folklore that blends African, Spanish, and Caribbean customs and traditions. Their name originates from "vejiga," which means "bladder" in Spanish, because the vejigantes used to arm themselves with vejigas (inflated cow bladders) and go around beating the evil spirits away from children and other innocent people—especially attractive, single women. While the lore of the festival may be a little suspect, the celebration itself has roots in Catholicism. As detailed in this excellent summary, the traditional vejigante costume requires three basic components: mask, cape, and suit. The mask is the most iconic and colorful of these essentials, and even it has rules and regulations—typically requiring teeth and horns. The festival ends with the Entierro de la Sardina, or "Burial of the Sardine." This mock funeral, complete with dummy-laden coffin, is in honor of the coming season of Lent. During the Entierro, a coffin and dummy are set on fire to symbolize the burning away of the sins of the flesh. Afterward, many of the bars and restaurants in Ponce will stay open late for all-night dance parties, feasts, and other festive events. In addition to marauding costumed vejigantes, expect a lot of traditional bomba y plena music, plenty of eating and drinking, and a chanting, boisterous crowd. There is also a parade for the King and Queen of the Carnival, and the aforementioned "Burial of the Sardine." It's Puerto Rico's biggest party—and a family-friendly event—so you'll see mini-vejigantes all over the place and can expect crowds, loud music, loud revelers, and a good time for all ages. Similar to Mardi Gras in New Orleans, you can expect accommodations and airfare prices to go up during this annual celebration. You may want to consider staying outside of town to avoid higher hotel fees, and if you are driving into Ponce and need parking, you can find plenty of metered parking on the street or public parking lots in the city. Even though it's cold in much of the United States in early March, Ponce in Puerto Rico will be warm and sunny, so you'll need to pack sunglasses, sunscreen, an umbrella for shade, and a large hat in addition to comfortable shoes, breathable clothing, and plenty of cash for water so you can stay hydrated.